On the Northwestern coast of the Hudson Bay, the once-crystalline ponds surrounding Kuujjuarapik village in Quebec, Canada have become turbid and brown. The dots of palsa, frozen and raised ground formations, have softened and collapsed inward, adding to the collection of muddied pools. As the years continue, scientists say, Kuujjuarapik’s landscape will continue to degrade, a result of the thawing of permafrost. Permafrost is soil that remains frozen for at least two consecutive years. It’s filled with ice, frozen leaves, twigs, and other bits of organic matter. During thaw, the ice turns to water and drains away, taking soil with it. The remaining defrosted organic matter decays and feeds a slew of microorganisms. As they digest, the microorganisms exude methane and carbon, creating a positive feedback loop between climate change and permafrost thaw. It’s well-known that permafrost thaw accelerates climate change, but scientists are now witnessing its destabilizing effect on physical landscapes. While it’s hard to visualize the increase of invisible greenhouse gasses from permafrost thaw, the impact of thaw on the tundra is visibly striking. Once-solid ground becomes mush. Sloping riverbeds crumble, turning into cliffs. Roads buckle under unstable, shifting soil. These changes will only continue as the globe warms, drastically altering the Arctic countryside, according to scientists and villagers who have been witnessing them more frequently over the last several years. Dr. David Olefeldt, an environmental scientist and professor at the University of Alberta, has been monitoring the spread of this phenomenon in the Arctic over the years. 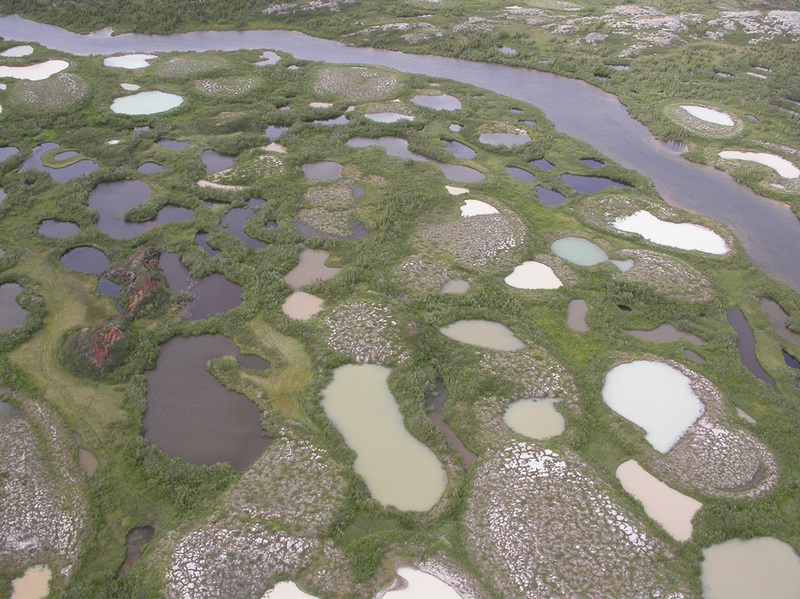 Olefeldt said that the thawed permafrost, called thermokarst, sometimes looks like a series of ponds dotted over a grassy patch of dry land. Thermokarst often manifests as peat, marshy ground typically covered in grassy weeds and scattered with sickly, teetering trees, more widely known as “drunken trees,” Olefeldt said. Elsewhere, thermokarst is identifiable as intense soil erosion on a steep river bank. In a study, Olefeldt said that by 2016, 20 percent of all northern permafrost had thawed into thermokarst. As more thermokarst sites develop, communities are witnessing vegetation shifts and losing their historic cultural sites. Plants that were once staples are now gone. 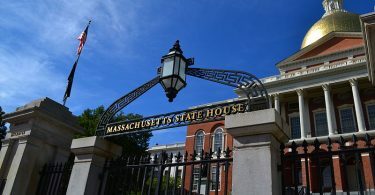 “The changes are very visible in the lives of people living there,” said Dr. Susan Natali, a permafrost scientist at Woods Hole Research Center in Falmouth, Massachusetts. During her work with two communities this past year, Natali noticed how the distortions caused by thermokarst affected local traditions. One man showed her an area where his family had been harvesting blueberries for generations. It was now berryless and covered with sedges, a grass that thrives in wet soil. The land had morphed from a stable permafrost region lush with fruit into an infertile marsh. The man’s traditional harvest ground had abruptly disappeared. The ice melt also transforms formerly clear ponds into tea-colored sludge. 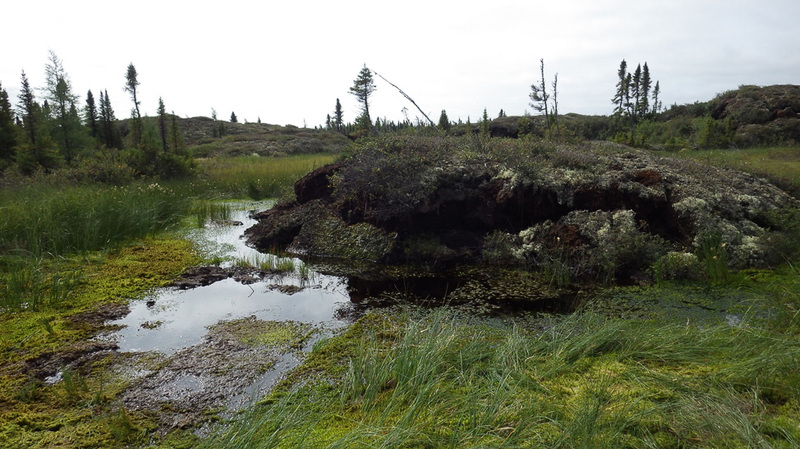 Maxime Wauthy, an ecologist and PhD candidate at University of Quebec at Chicoutimi, called this process “brownification.” Wauthy recently published a paper examining how permafrost thaw increases the amount of organic matter in freshwater ponds, turning them brown. He found that there was more decayed organic material in Arctic ponds than years before. Clear ponds usually contain an array of microorganisms, a majority of which rely on photosynthesis. When ponds become murky, less light can penetrate the water, limiting photosynthesis and allowing other microorganisms to populate. The microorganisms that don’t need sunlight digest permafrost thaw’s residual organic material and emit methane, a potent greenhouse gas. Most Northern communities need these freshwater sources for water, which becomes a big problem when the ponds turn murky. “You have to spend more time and money to be able to just drink the water,” Wauthy said. “It’s expensive.” During his field research, he spoke to the townspeople of Kuujjuarapik who pointed him towards the ponds that were browning. The people noticed how rapidly the freshwater darkened and told Wauthy that the quantity of fish in the area’s surrounding ponds had dwindled over the past 30 years. Wauthy said that in as little as two to three years he’s seen ponds completely transform into impenetrable muck. As thermokarst forms and melted ice drains into ponds, wide-scale erosion washes away land in coastal communities. Buildings are at risk of collapsing in local communities perched on unstable ground, such as Kuujjuarapik. 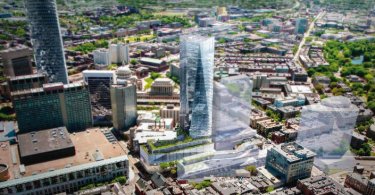 A lot of people put their buildings on stilts to avoid heating the permafrost under their houses, Olefeldt said. He, Natali, and Wauthy agree that Northern communities are acutely aware of their fragile territories’ transformation. Natali in particular stresses the danger of permafrost thaw on infrastructure. She has heard of villages where thaw-induced erosion washed away historic fish-drying huts. Yet some scientists doubt that permafrost thaw is solely responsible for building collapse and other structural damage. 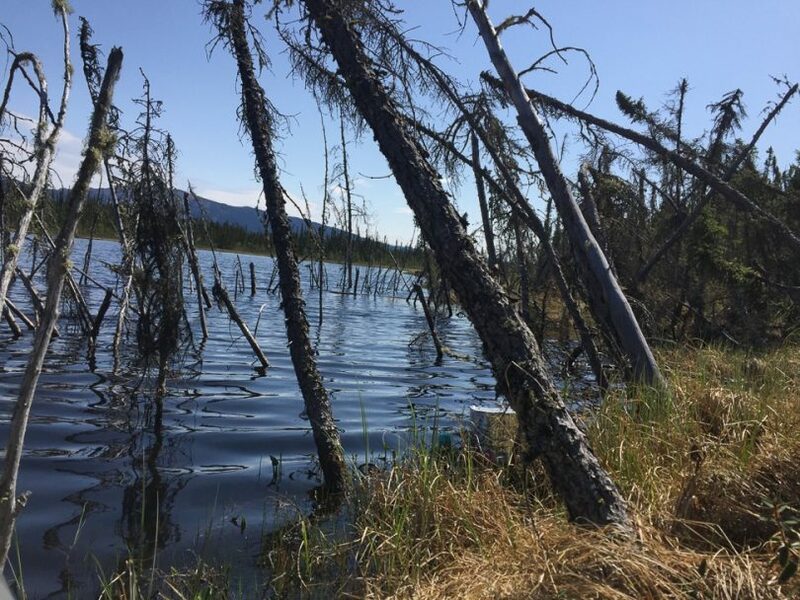 Kenji Yoshikawa, a professor at the Water and Environmental Research Center at the University of Alaska Fairbanks, believes permafrost thaw is frequently misused as an excuse for shoddy municipal workmanship. Although Yoshikawa acknowledges that permafrost thaw can cause erosion, he said that it has been happening for centuries. To him, lazy construction – at least in Fairbanks – is to blame. In the coming decades, more and more of the Arctic permafrost will thaw into thermokarst, turning more freshwater ponds brown and causing wide-scale soil erosion. More northern villages will turn into Kuujjuarapik.